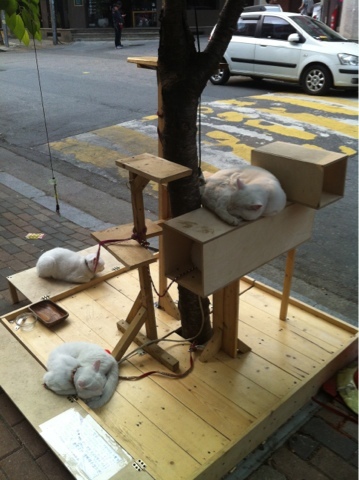 One summer day this year, while strolling through Hapjeong/Hongdae area, we stumbled upon a cat tower right on the pedestrian street. I've never seen such a sight. I've seen dogs tied outside, but not 3 white cats tied to a tree/cat tower. More than awes, I caught myself confused. At least the cats didn't seem to care and looked at peace. Although this was the last time I saw this cat tower there.